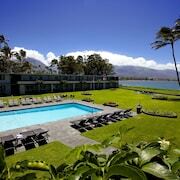 What are the top landmarks in Maui? As one of the highest-ranking luxury beaches in the U.S., this stunning stretch of sand with crystal-clear water is lined with high-end hotels and shops. This vacation accommodation hotspot has everything you need. Its protected waters attract swimmers and snorkelers in summer, and surfers and body boarders in winter. When you visit Whalers Village, a favourite shopping spot in Kaanapali, you can browse for souvenirs. Wander the beautiful beaches and seaside in the area. This stretch of powdery sand is part of an upscale resort community and is an ideal place to sunbathe, snorkel, and dive with Hawaiian green turtles and manta rays. Explore the great outdoors with a trip to Haleakala National Park, a popular green space in Kula. Wander the seaside and black-sand beaches while you're in the area. Calm, luxurious, picturesque and visited by amazing marine life, this is one of West Maui’s more family-friendly swimming and snorkeling destinations. Indulge in Hawai’i’s high life with a stay in this beautiful coastal area known for its luxury accommodation and secluded beaches. Downtown Lahaina is a welcoming neighbourhood. Take in the natural beauty of the seaside, sunsets and island views – or broaden your horizons with some local live music and theatre scene. 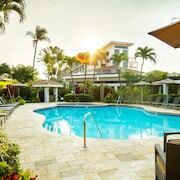 The Napili neighbourhood welcomes visitors, with its convenient options for seafood restaurants. Many visitors come to bask in its beautiful outdoor setting, epitomised by the seaside, sunsets and island views. Historic Lahaina Front Street is a welcoming, walkable neighbourhood. Take in the natural beauty of the sunsets, island views and seaside – or broaden your horizons with some local theatre scene and live music. Style guide: What to wear on Maui. Opens in a new window. The Hawaiian island’s sunny weather and rich, volcanic soil make it a farmer’s paradise. Farm to fork fun in Maui. Opens in a new window. It was everything that should be expected. Great staff, very clear about expectations. Friendly neighbors. Pool was great! Clean. Affordable. 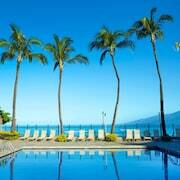 If I go back to Maui I’ll be staying here. My kids and I had the trip of a life time. They told me my extra food would be donated to the food bank. Thank you. Kids activities (mini golf, ping pong, pool, sand toys) and set up of suite room (nice pull out couch, separate sleep area, kitchenette) were beneficial. The Hawaiian island of Maui is a popular destination for luxury and romantic breaks, but the Pacific island offers so much more than a tropical getaway. 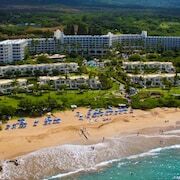 Miles of sugar-white beaches line Maui Island, perfect for sunbathing but also great for having a go at surfing and windsurfing, body- and boogie-boarding. Whale watching from Maalaea and snorkelling in Kaanapali’s Black Rock provide a chance to meet some of Maui’s exotic sea creatures. Back on dry land, you could hike across volcanic craters or sit back and enjoy a traditional luau party to experience Hawaiian life and culture on Maui Island. A number of large international airlines, including Virgin Atlantic and American Airlines, fly to Maui Island’s main airport, Kahului Airport (OGG), throughout the year. There are also two smaller commuter airports on either side of the island: Kapalua (JHM) and Hana (HNM). Daily ferries run between Maui and the islands of Lanai and Molokai. There’s a wide choice of accommodation on Maui Island, from affordable bed and breakfasts within towns to luxurious all-inclusive resorts. Much of the low-cost and mid-range accommodation is self-catering, offering plenty of practical facilities and located close to supermarkets and restaurants. Maui Island may only be small, but it can easily be split up into distinct areas. Once a holiday spot for Hawaii’s royalty, West Maui is now a busy area of large resorts, shopping and offering a range of leisure activities. One of West Maui’s highlights is the former whaling town of Lahaina, where you can head out to spot whales off the island’s coast. 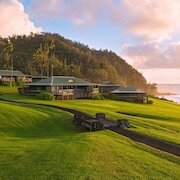 Hana is a small town on Maui’s largely unspoiled eastern coast. The only way to get to the town is past stunning coastal views and through tropical rainforests along the famous Road to Hana. The black-sand beach at Waianapanapa State Park is a perfect snorkelling spot and the large Hawaiian temple of Hale Piilani is in one of Hawaii’s five National Tropical Botanical Gardens. 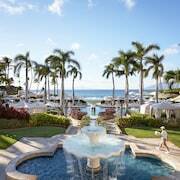 Maui Island has hot weather all year round. July can be an expensive time to visit especially during the island’s 4th July celebrations, which involve a large rodeo and cowboy parade. January to March is the best time for whale watching. The island’s quiet season is in October and November, and while the weather is still good in both months, many hotels lower their prices. Maui Ocean Center gives you the chance to explore Hawaii’s shores without stepping foot on a boat. As part of its mix of indoor and outdoor exhibits, the aquarium contains the world’s largest collection of live corals from the Pacific. To explore Maui’s landscape, head to Haleakala National Park. The area is linked to many ancient stories from Hawaiian culture and is also home to a few endangered species. Popular with hikers, the park’s landscape is made up of volcanic terrain and rainforests. You can adventure in the park around the clock and many people head to its highest point to watch the night sky. Explore Maui with Expedia's Travel Guides to find the best flights, cars, holiday packages and more!